This is one I did last week at my crop! I didn't get a whole lot done, but it was sure fun. I love to scrapbook pictures of Miles, because he is always grinning. He has a great grin. Paper is Scenic Route, cardstock is Bazzill, pen, sticker and brads are American Crafts, Cricut cartridges are Street Sign and Planton Schoolbook. I don't think I've shared this one on here before, so I'm going to do it now. I love how tiny she is. This is just before leaving the hospital. 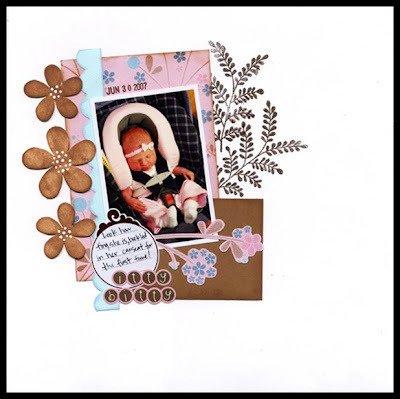 Paper is Heidi Grace, chipboard is Making Memories, journaling spot and pen are American Crafts, stamp is Cactus Pink, letter stickers are KMA.